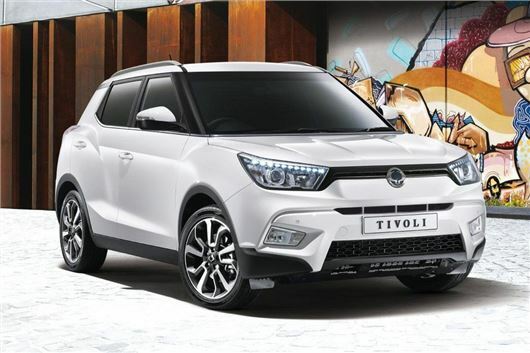 SsangYong has announced that its new small crossover, the Tivoli, will cost from £12,950 when it arrives in Summer. The attractively styled Nissan Juke rival will be offered in three trim levels, with a choice of petrol or diesel engines and front or all-wheel drive. Buyers can choose beteen a 1.6-litre, 128PS petrol engine or a 1.6-litre, 115PS diesel. Manual, front wheel-drive petrol models have an official economy figure of 44.1mpg and emissions of 149g/km. Figures for the diesel are to be confirmed, but official economy should be around 58mpg for the front-wheel drive manual. The entry-level SE model gets cruise control, Bluetooth and 16-inch alloy wheels among its standard equipment. Mid-level EX trim is priced from £14,600 and gains leather upholstery, 18-inch alloy wheels, dual-zone climate control, a touch screen system, rear parking camera and heated seats. Those who pick EX trim will be able to choose between manual or automatic transmissions. Buyers of the manual diesel variant get the option of all-wheel drive. The top ELX model benefits from a smart instrument cluster, keyless entry and start, front and rear parking sensors, automatic lights, automatic wipers and TomTom navigation. ELX models cost from £16,000, rising to £19,500 for the diesel 4x4 automatic. Among the customisation options is red leather upholstery, a styling pack and various paint finishes.